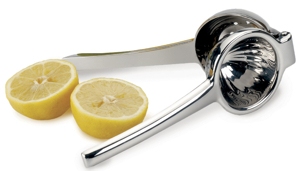 Our hand-held, Endurance brand, Lemon & Lime Juicer makes quick work of juicing lemons and limes for lemonade, iced tea, hot tea, beverages, or cocktails. Comfortable handles provides powerful leverage for quick juice extraction. Place half of a lemon or lime in the juicer and squeeze the handles together. The juice will pass through the drain holes and leave the seeds behind. Commercial quality 18/10 stainless steel with a mirror finish exterior. Dishwasher safe.